Q: Do we get a refund if someone in my group gets food poisoning or gets sick with the flu and does not want to go out? A: If you give us enough notice (12 to 24hrs) we can try to sell your seat. If we do sell your seat then we can refund your money. However, if it is a last minute notice and we have no chance to resell your seat, we cannot refund your money. It’s like buying any ticket to a concert or game. Q: Can we request a certain Captain or vessel? A: Yes, you can request a certain vessel if you book early enough. However, you cannot always get the Captain you want. I'm sorry, we can't promise you a certain Captain. Our Captains run all the boats depending on what is going on. They are all highly experienced, seasoned Captains. We have very high standards for all our Captains and Crew. Q: Why do your prices appear higher than everyone elses? A: Because, we are giving you the TOTAL AMOUNT UPFRONT that includes the 7% borough tax, the $3.50 Harbor Tax. Most Charter fishing websites are giving you the BASE PRICE with the added costs at the bottom of the page as a bullet. Make sure you ask for their total price including everything. You will see our prices are comparable if not less than other charter operators. Q: What is included in the price of a charter? A: The charter price includes all the bait, tackle, and gear you’ll need, as well as the filleting of your catch. Q: What is customary for tipping the crew? A:The Captain and the Deckhand split the tips. So at the end of the day you can tip either Crew and they will split the tips at the end of the day. You are welcome to tip them when you get off the boat or at the fillet station. 'Our crew does appreciate the generosity of tips and realize it's a gift NOT an entitlement. They know it’s a sign of appreciation in reflection of how hard they work. We recommend $25.00-$30.00 per client to be given to either crewman to be split between crew. 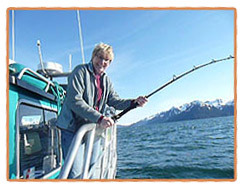 A: Anyone aged 16 or older needs an Alaska State sport fishing license. For Alaska residents the cost is $24 annually. For a non-resident, license can be purchased for 1 day for $25.00; 3 days for $35.00; 7 days for $55.00 and two weeks for $80.00. 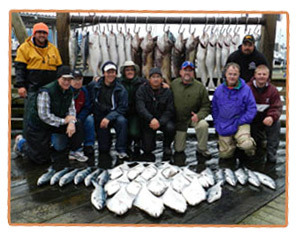 A separate stamp is required for King Salmon fishing. A: We sell fishing licenses at our charter office. 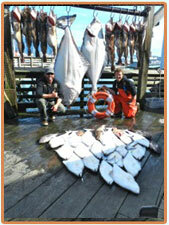 They are also available at Carr’s/Safeway grocery stores throughout Alaska and at the Fish House in Seward. 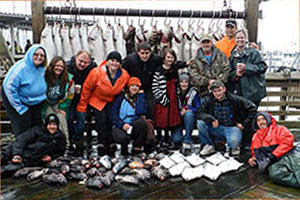 They may also be ordered online through the Alaska Department of Fish and Game website. A: In addition to a fishing license, you will need to bring food and beverages. We recommend you wear warm, layered clothing and water-resistant shoes, and bring raingear, hat, gloves, sunscreen, sunglasses, and seasickness remedies. You might want to bring a camera and binoculars, as well. A cooler is helpful for transporting your fish home at the end of the day. A: You won’t need to bring your fish cooler out on the boat – there will be time to get it as the fish are being filleted. You’re welcome to bring a small cooler for your lunch, if you’d like. Q: What should I leave behind? A: Do not bring illegal drugs, marijuana, guns, GPS units, e-cigs or vapes of any kind. Smoking is not allowed on any vessel. A: Although we do not allow hard liquor on board, you are welcome to enjoy a moderate amount of beer during your trip. No glass bottles please. A: Smoking of any kind are not permitted on our vessel. A: You are certainly free to bring your own gear, although we do supply gear as part of the trip. A: For charters, we accept cash, checks, and VISA and MasterCard. We cannot accept Discover or American Express. For fishing licenses, we can accept only cash or checks – not credit cards. A: Trips cancelled because of weather conditions will result in a complete refund of your trip. Cancellations made 30 days or more prior to the trip result in a full refund. If the cancellation is made within the 30 days prior to the trip, your 50% will be forfeited. If we need to cancel the trip because of mechanical problems, we will work to place you on another boat or refund your trip, at your discretion. We recommend you consider trip insurance. We cannot be responsible for cancelled flights, personal illness or other emergencies. We realize it is difficult to go out if someone in your group gets sick while you're traveling in Alaska. However, we cannot refund if someone is sick and does not want to go out. The sooner we know before your trip that someone got ill, we can try to sell the seat. We can refund your money if we can sell the seat at the last minute. The sooner you call us to let us know someone is sick in your group the better chance of a refund. A: There are large public parking lots at both the north and south ends of the Seward Small Boat Harbor on Fourth Avenue. The lot closest to our office and to the slips where our boats are docked is the North lot, between the Texaco station and the NAPA store. The cost for parking is $10 per day. Note the space in which you are parked. There is an unmanned collection station at each lot. A: Our office is located at 411 Port Ave in the "Train Wrec", a group of trains turned into businesses. Please follow the Puffin Fishing Charters signs. To get to the office as you drive into Seward turn left on Port Ave. The "Train Wrec" is right in front of you at the intersection of Port Ave and 4th Ave. Parking is across the street for $10.00 for the day. There are kiosk's available for parking payment. A: You decide whether or not to keep a fish you catch – we don’t choose your fish for you or make you keep fish you don’t want, unless that fish will not survive if it is released. The fish are marked so you can identify which fish you caught and take those specific fish home with you. Q: What if I don’t want all my fish? A: We ask that you release all fish that you don’t plan to eat. Sometimes people find out the cost of processing and shipping their fish then decide they don’t want it. Consider this as you’re out fishing and we’ll help you release the fish you don’t need. Q: Where can I get my fish processed? 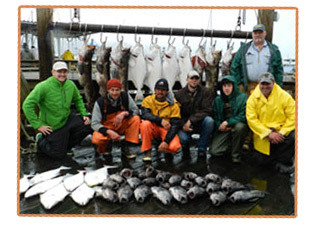 A: You can get your fish processed at "Captain Jacks" or "J-Dock Processing". Captain Jacks fish processing company is in the Seward Small Boat Harbor at the southern end of the harbor, near the Harbormaster’s office. They can vacuum pack and freeze your catch, then ship it to you or package it for you to take with you on the plane home. J-Dock Processing, J-Dock is located at the North end of the harbor..
Q: Do you “party fish”? A: We do not party fish. It is illegal per Alaska State Law. Q: Can I catch fish for my friend who’s sick? 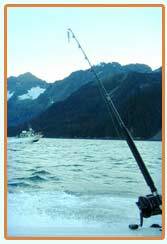 A: Under Alaska law, the person who hooks the fish is the person who caught it. You can help someone reel up a fish, but they need to have hooked it or it will count against your catch limit. 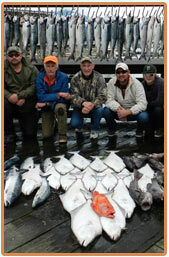 Q: What is the catch limit for halibut? Salmon? Rockfish? Lingcod? 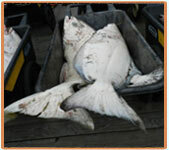 A: The catch limit for halibut is two per person per day. 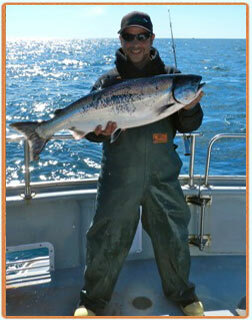 For salmon (excluding King or Chinook salmon), the limit is six per person per day. 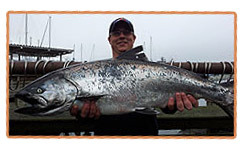 For King Salmon the limit is two per person per day. 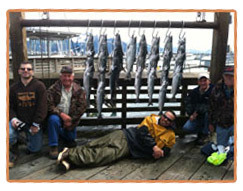 When fishing outside the bay, only three of these six can be silver salmon, while inside Resurrection Bay, all six could be silvers. 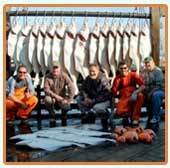 The limit for black bass/rockfish is four per person per day; for yelloweye rockfish and lingcod, the limit is one or two, depending on the area fished. Q: How long does it take to get to the fishing grounds? A: It takes us about two hours to get to our prime fishing spots. Sometimes the fish are closer in and sometimes the fish are further out. On the "long range" trip you can expect to travel 2 to 2 1/2 hours. On the "short range" trip 1-1 1/2 hours. Q: How fast is the boat? A: Our boats travel at speeds in excess of 24 knots. A: We are a near coastal fishery. We seldom are more than 5-8 miles offshore. So if the weather is good we go offshore a little and if the weather is getting choppy we have in-shore protected areas we can fish. What’s the elevation of Seward?